In Frequency Modulation AFM (FM-AFM), the cantilever acts as the oscillator in an active feedback circuit. The resonant frequency of the lever changes due to the force interaction between the cantilever tip and sample. Changes in the resonant frequency are detected by an FM demodulator. The feedback is used to keep the lever oscillating at its resonant frequency and at constant amplitude. This technique facilitates the use of high Q levers without restricting the bandwidth or the dynamic range. FM-AFM is usually used in ultra-high vacuum but we wish to use the highly sensitive technique in liquid. This has been achieved by combining FM-AFM with direct magnetic activation of the lever. We have recently deduced simple equations that enable the interaction force and energy to be determined directly from the measured frequency shift. where a is the amplitude of oscillation. Figure 3: Actual (solid line) and recovered (dashed line) Lennard-Jones force law using the new arbitrary amplitude formula. A spectrum of oscillation amplitudes ranging from a/l = 0.1 to a/l = 10 were used. 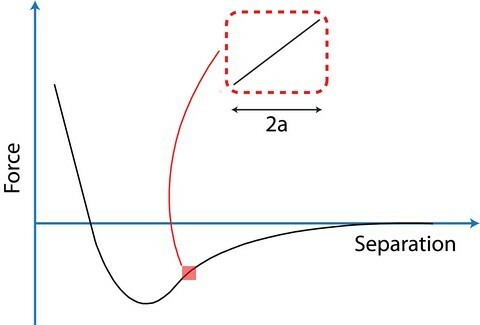 z is the tip-sample separation and l is the separation where the attractive force is maximum. However, this relationship does not provide an intuitive connection between frequency shift and force, except for the small amplitude limit.We have mathematically analyzed the behavior of the frequency shift as a function of oscillation amplitude and established that, in the large amplitude limit, the frequency shift is proportional to the half fractional integral of the force, or equivalently, the half fractional derivative of the energy. This finding concurs with the observation that the frequency shift is intermediate to the force and energy for specific force laws. 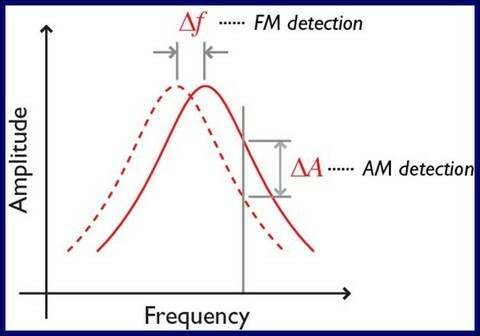 Our analysis also shows that FM-AFM should be interpreted in general as a fractional differential operator, where the order of the derivative/integral is determined only by the oscillation amplitude relative to the length scale of the interaction.The analysis has yielded simple yet accurate analytical formulas that enable the direct determination of the interaction force and energy from the measured frequency shift. These formulas are valid for any oscillation amplitude and can be used with any force law. The Mathematica code for force conversion can be downloaded here. Quantitative force measurements in liquid using frequency modulation atomic force microscopy, Uchihashi, T., Higgins, M. J., Yasuda, S., Jarvis, S. P., Akita, S., Nakayama, Y., and Sader, J. E., Applied Physics Letters, 85, 3575-3577, (2004). Interpretation of frequency modulation atomic force microscopy using fractional calculus, Sader, J. E., and Jarvis, S. P., Physical Review B, 70, 012303, (2004). Accurate Formulas for Interaction Force and Energy in Frequency Modulation Force Spectroscopy, Sader, J. E., and Jarvis, S. P., Applied Physics Letters, 84, 1801-1803, (2004). Quantitative force measurements using frequency modulation atomic force microscopy - theoretical foundations, Sader, J. E., Uchihashi, T., Higgins, M. J., Farrell, A., Nakayama, Y., and Jarvis, S. P., Nanotechnology, 16, S94-S101, (2005). Coupling of conservative and dissipative forces in frequency modulation atomic force microscopy, Sader, J. E., and Jarvis, S. P., Physical Review B, 74, 195424, (2006).